I’m always on the lookout for great eye-care products. Here are just a few I’ve come across recently. [comfort zone]’s eye supreme, a multi-active anti-aging spa eye-care system, is simply awesome. There are three products in this line. I use the intensive extra cream at night for maximum hydration and rejuvenation. The cream gel soothes and hydrates, helping to de-stress the area. I use the Cream Gel during the day, as it helps to reduce puffiness. Both are especially helpful to contact lens wearers and people who are in front of a computer for hours. And finally, the multi-active patch. Place the patches under your eyes for ten minutes and remove. They immediately reduce the puffiness and feel great! You can wear them while you do chores or lay back and relax for an overall pick-me-up. Prices vary. Go to http://comfortzone.it to learn more. EGF Reactivator Triple Action Eye Complex is a serum that’s helpful in diminishing dark circles under the eyes. Peptides help strengthen tissue and improve the circulation of collagen. It appears to be an oil, but has a smooth texture that is absorbed nicely into the skin. A one-ounce bottle costs about $65, but lasts forever. 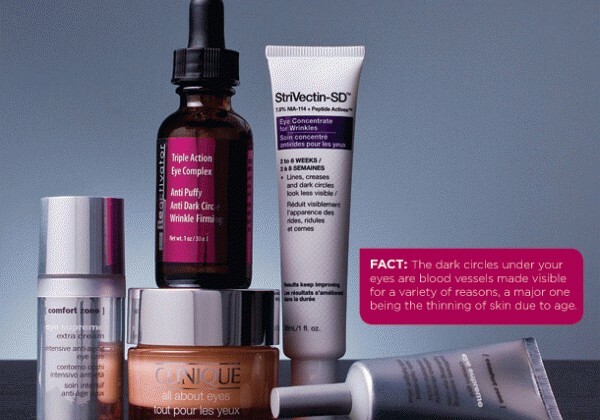 StriVectin-SD Eye Concentrate for Wrinkles is another good choice. It also uses peptides to improve the appearance of fine lines around the eyes in two to eight weeks, renewing collagen and increasing elasticity. A one-ounce tube should last you the six weeks and costs about $59 online. Sue Devitt’s Microquatic Prime Target Intensive Eye Treatment comes in a tube with a pen-tip applicator. The website claims the gel targets areas that need hydration much like a global positioning system would. It also contains those popular peptides, as well as caffeine, which has been shown to be helpful in firming skin. It runs about $28 for .14 ounces. Finally, Clinique’s All About Eyes serum helps de-puff with a cooling rollerball applicator. Caffeine is used here, too, as well as soothing botanicals and other anti-oxidants. And the rollerball helps massage away bags and fight dark circles. The half-ounce tube costs about $26. FACT: The dark circles under your eyes are blood vessels made visible for a variety of reasons, a major one being the thinning of skin due to age. If you have a favorite eye care product you’d like me to check out, let me know at toni@nulllipulse.com.